Andrew Lockrem was born in Norway on December 22, 1838, and moved to America with his family in 1848. His family homesteaded six miles south of Northfield, Minnesota, in an area known as Valley Grove. On January 20, 1861, Andrew answered a recruiting broadside in the “Northfield Telegraph” for all superior marksmen to try out for an elite group of sharpshooters, the First Regiment of United States Sharpshooters under Colonel Hiram Berdan. Hiram Berdan was nationally famous for being one of the best marksmen in the country. He petitioned President Lincoln and Congress to develop a regiment of sharpshooters from all over the United States. Each company of about 100 soldiers would be from a different state, making this one of the first national regiments. Berdan wanted his regiment to be unique. He designed a uniform that hinted at an attempt at camouflage. 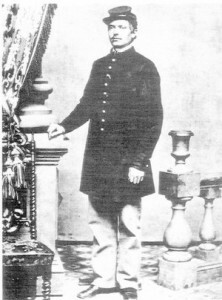 The first uniforms were light blue trousers with hunter green frock coats and caps. The buttons were made of a hard rubber and did not shine like brass buttons. Later versions of this uniform added green trousers and brown leather leggings. Captain William Russell sent a Northfield native, Corporal C. R. Eldridge, to test many men in the area to see if they could pass the exacting test of hitting 10 consecutive shots in the red target of 20 inches in diameter placed at two hundred yards. Lockrem passed this test of marksmanship along with his two friends and neighbors, Halvor Quie and Fingal Fingalson. They all enlisted on January 20, 1862. Lockrem was 25 years old. He stood 5’10” tall. He had a light complexion, brown eyes and light-colored hair. Halvor Quie was 27, and Fingal Fingalson was the youngest at 19. One hundred men and three commissioned officers formed “Company L” or “The Second Company of Minnesota Sharpshooters.” All but five were from Minnesota. Their captain was Captain William Russell. The men of “Company L” gathered at Fort Snelling, Minnesota, for some basic training. In April 1862 they travelled by train to Washington D.C. On May 3, 1862, they left Washington for Virginia to hook up with the First Regiment of United States Sharpshooters who were already engaged in a Union offensive called “The Peninsular Campaign.” The men of “Company L” reported for duty to Colonel Berdan on May 7, 1862, at his headquarters at Camp Winfield Scott. On the afternoon of May 8, 1862, the company received their arms, the Sharps 54-caliber breech-loading rifle. This rifle enabled a soldier to load the rifle from the breech instead of down the muzzle. A soldier could load the weapon lying down or on the move. The Sharps gave a soldier a greater rate of fire than most muzzle-loading rifles or muskets. On May 12, 1862, they received their first lessons in company movements and in skirmishing from Captain Edward Drew of Wisconsin’s Company G. Skirmishing means to go out well in front of the main body of troops to engage the enemy, scout the enemy positions, and test their strength. The sharpshooters would also be used as snipers to harass artillery positions and enemy pickets, or to slow the enemy’s advance. The goal of the Peninsular Campaign was to capture Richmond, Virginia, the capital city of the Confederate States of America. Andrew saw much action during this campaign in a series of battles and Union retreats known as the “Seven Days’ Battle” or the “Seven Days’ Retreat.” While in Virginia he participated in the Battles of Hanover Courthouse, Fair Oaks, Savage Station, White Oaks Swamp, Malvern Hill, and the evacuation at Harrison’s Landing. On May 30, 1862, Lockrem and “Company L” received an order to report to The First Regiment of Minnesota Volunteers. This news was well received by the men of “Company L” who were proud to serve with their fellow Minnesotans. They joined the First Minnesota on June 3, 1862, during the Battle of Fair Oaks. From this date until November 23, 1863, the men of “Company L” fought alongside the First Minnesota. The Union forces were battled out of Virginia in August of 1862. “Company L” moved north with the Army of the Potomac to defend Washington D.C. This defeat was very hard on Union morale. In September of 1862 General Robert E. Lee’s Confederate Army invaded Maryland in the hopes of drawing the Union Army out of Washington D.C., destroying it and forcing the Northern States to sue for peace. The Union forces caught up with the invading Confederates at Sharpsburg, Maryland, near a creek called Antietam. On September 17, 1862, around 4:00 a.m., Lockrem, “Company L”, and the First Minnesota “coffeed up” and from a farm they watched the Union and Confederate forces slam into each other at a place called “The Cornfield”. Around 7:00 a.m. the Second Corps under General Sumner was called to attack. The men crossed Antietam Creek and the 5000 men of General Sedgwick’s division formed into three lines with a brigade in each line. The First Minnesota was placed in General Gorman’s front line holding the right of the line. “Company L” was on the left of the First Minnesota. As they passed a grove of trees called “The East Woods” they were greeted with a most horrific sight. Thousands of Confederate and Union dead and wounded troops were lying on the field so thick it was hard to march without stepping on the victims of that morning’s slaughter. “The Cornfield” was so shot up that the corn stalks looked as though they had been cut with a knife. The ground was soaked with blood and formed a foul mud on the shoes of Andrew and the 5000 men who marched shoulder to shoulder across this field. The pleas of the wounded begging for water or asking to not be stepped on filled their ears. Groups of exhausted Union troops from the morning’s battle cheered on the Union advance. As they crossed the field, the Union line started to experience the first artillery barrage of solid and canister shot. The Confederate forces under General Thomas “Stonewall” Jackson opened fire on the advancing Union troops from a grove of trees called “The West Woods.” The Union line entered the woods and exchanged fire with Jackson’s men for about an hour. General Sumner was confident that his Second Corps could merely sweep around the Confederate left and encircle these troops. He was surprised when the Confederate Army flanked his left and poured fire into his line. This started a massive panic and retreat of the Union forces. “Exactly where I was headed for,” Fingalson answered. Lockrem was shot twice in the left thigh. One bullet went clean through, but the other lodged in his flesh. He went down and could not get up. He watched helplessly as Colonel Sully finally ordered the gallant First Minnesota to withdraw from the field. It was at that time that Lockrem was captured and taken prisoner by the Confederate forces. One can only imagine the nightmare of a Confederate field hospital during and after the Battle of Antietam. It was the single bloodiest day of fighting in American history. It was a miracle that Lockrem survived the experience with his leg intact. He was freed in a prisoner exchange a few days after the battle when General Lee and the Confederate Army retreated across the Potomac River to Virginia. On October 11, 1862, Lockrem was paroled at the School House Hospital in Chambersburg, Pennsylvania. While there he received a letter from his fiancée, Anna Halverson. In the letter she placed a lock of her hair fashioned into a watch fob. She also told him about the Minnesota Massacre in which hundreds of Minnesota settlers were killed when the Dakota Indians led one of the largest uprisings in American history. Lockrem was discharged for disability and mustered out of the Army on February 25, 1863. He returned to Northfield, Minnesota, to his family and his beloved Anna. They were married on May 17, 1864, and together raised a large family of seven children. In 1882, Andrew, Anna, and their children moved to North Dakota’s Red River Valley. They homesteaded north of Park River, North Dakota, along the middle branch of the Park River. These pioneers lived, loved and eventually died there. Anna died in 1908 and Andrew died on July 20, 1910. They were founding members of the Park Center Church, and they are buried in that church’s cemetery. Note: Fingal Fingalson was wounded in the leg at the Battle of Hanover Courthouse but returned to the line. He later suffered a sunstroke which caused him to faint and experience memory loss. After his wounds at the Battle of Antietam, Fingal Fingalson was sent to the Ladies’ Hospital in New York City to recover for nine months. This hospital was also referred to as the New York Army Hospital. While recovering he was ordered to help stop the “New York City Draft Riots” that were so deadly and destructive. 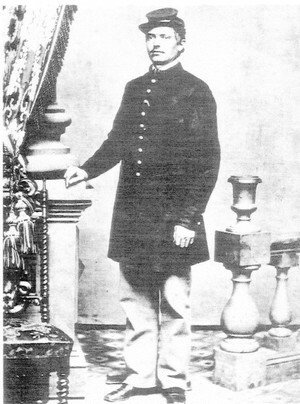 He was later promoted to sergeant and mustered out of the service on April 2, 1865. Fingal returned to Northfield and married Andrew Lockrem’s sister, Malina. They later homesteaded in Becker County near the town of Calloway, Minnesota. They raised a large family. Malina died in 1891 and Fingal died in 1930. Halvor Quie was sent to recover from his horrible heel wound in Annapolis, Maryland. He was discharged for disability on January 8, 1863. Quie returned to Northfield, Minnesota, and married Anna Finseth in 1865. They lived in the Valley Grove community six miles south of Northfield. They also raised a large family. Quie died in 1919. He and Anna were buried in the cemetery at the Valley Grove Church. According to their military records, all three of these brave and honourable men suffered greatly for the rest of their lives due to the terrible wounds they received at Antietam. About the author: Mark Daley is a high school history teacher in Santa Fe, New Mexico. This article first appeared in the Northfield News on September 18, 2012. The article and photographs are reprinted with permission of the author.